Three of our AmeriCorps members are stationed at Harbor Elementary School this year and have been very busy teaching about the ocean! Harbor Elementary is one of our donor sponsored classroom schools, and our members have made such an impact on the students. So far this year, Meridan, Emily, and Braxton have been working hard making lesson plans, teaching, and scheduling field trips! The team brought Pre-K, kindergarten, and fifth grade classes to New London Community Boating at Greens Harbor earlier this fall. Students got to learn about the ocean and even got to try out the Opti Trainers! At school, the team teaches multiple 35-minute lessons to classes at the school every day, rotating through different grades. Recently, we stopped in to join a kindergarten class during NESS enrichment time! “A, B, Seas” is the theme for kindergarten NESS students. Throughout their time with NESS, students will learn the letters of the alphabet focused on an ocean topic that begins with each letter. The day we visited, the letter was “D” for dolphin! The students started out on the carpet and reviewed what they learned last class, that dolphins are mammals and breath air just like us! Next, the students learned about how dolphins communicate. 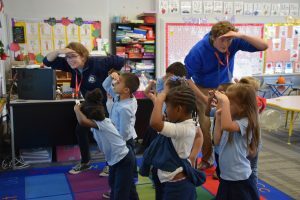 Through games and songs, the kindergarteners learned about echolocation and how dolphins use clicks and squeaks to communicate with each other and learn more about their surroundings. The students had so much fun learning and playing with the NESS educators. NESS gives the students the opportunity to break out of the mold of the regular school day and learn new topics through interactive lessons. You can really tell how much students enjoy being a part of the NESS family! Many Harbor students spend time afterschool at the Drop in Learning Center (DILC) of New London where NESS runs a one-hour program each week. Before program, the AmeriCorps members help with homework and reading time. 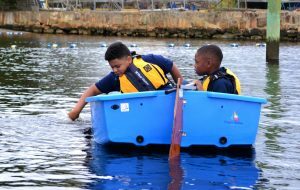 During this time, all the Harbor students enjoy spending more time with the members outside of school, whether it be working on homework, reading books, or playing chess. One of the second graders lit up when asked about NESS! She said “Yes! I know Miss Meridan, Mr. B, and Miss Emily! We learned all about molecules! Do you know about molecules?” She continued to tell me all about what she had learned during NESS enrichment and said that she really hoped NESS was going to be for the 2nd graders at the DILC that day. Something that makes the AmeriCorps team so invaluable is their ability to create relationships with the students and support them during and outside of the school day. Not many other afterschool or enrichment programs are able to offer this. But due to our donor sponsored classrooms, we can spend the most amount of time teaching and mentoring the students of New London Public Schools! Big thanks to our Harbor team and everyone who makes what we do possible!